You can call her Alexis, but her close friends and Instagram followers call her “Complexis” – in fact, according to one Facebook post, Alexis Levine was considering officially changing her name to just that. Then again, this is social media we are talking about. Which brings us to our next point, without social media and networking and things such as “apps” which perform onÂ multiple platforms, where in the hell would we be? 2002 that’s where we’d be, and no one, no one, my friend, ever, ever,Â wants to be back there. So we are embracing the faster, quicker, more connected ways to converse and learn, move and shake, cook and bake, and participate, in life. After all, who wants to sit on the side lines? Get on the court, on the field, get dirty, get in on the action and LIVE LIFE for Pete’s sake. That’s just what our DC/LA/NYC/Austin/Miami/more and more traveling ball of energy (seriously, she is so petite, yet so full of this firecracker energy, you wonder if you need just a smidgen of what she’s having in life-which is fun, duh) entrepreneur Alexis “Complexis”Levine decided to create with Savvy City. The concept launched last year and the app is a FREE event-specific app which connects brand sponsorship with a personal VIP experience. 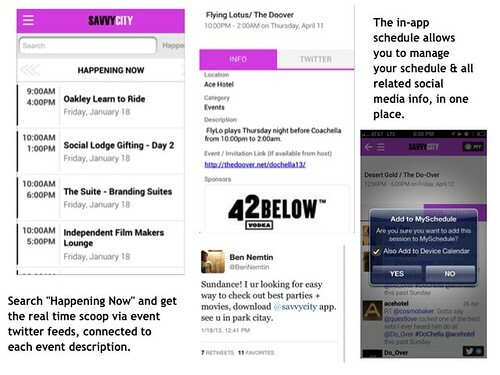 The Savvy City app aggregates all of the see and be seen VIP events and connects tastemakers in real time with the brands that benefit from their personal social cache. For tastemakers, the Savvy City app simplifies the VIP experience, and provides THE event-specific guidebook that maximizes the experience. For VIP brands, Savvy City offers direct access and user-generated content in return for VIP use. For the second year in row #SAVVYCITY headed down to Miami and went LIVE through the Miami Art Basel festival. “We set out to engage consumers who attend massive events like Art Basel and SXSW in a new way. Consumers want more information at their fingertips especially when there is so much going on and itâ€™s difficult to filter. Brands are looking for more efficient ways to engage,” commented Alexis. on the Sole Bike in Miami – this girl knows how to work hard and play hard and get sh*t DONE! Beyond the mobile guide, Savvy City is a game that runs like an arcade called the â€œSocial Currency Gifting Suite.â€ App users can win points by taking social actions (all tracked by hashtags within the app). These points can then be redeemed for prizes like VIP event access, music festival tickets and more. The Savvy City app has integrated with Instagram, Twitter, and Yelp and allows brands to create social currency games for consumers to participate in. This year, Savvy aggregated the largest list of unofficial events with RSVP info for Sundance, SXSW, Coachella, Cannes Film Festival and NYFW. In addition to all the social activation during Art Basel, Savvy City also collaborated with some amazing artists to bring life of the #savvycity brand on the streets of Miami with custom painted Sole Bikes at various events through Art Basel Miami Beach. Collaboration and creativity are key in this game, but execution, as Alexis knows, is the determining factor in longevity. Get in the game and download the SavvyCity app. Headed to Sundance? Let us know! Follow on Twitter, Instagram, Facebook and all that social media jazz. Prev Daikaya Will Knock Your Sake Off!